7 Quick Takes — [Vol. 10] | Pray. Work. Motherhood. Busy weeks ’round these parts! It’s fall, y’all, and though the Lone Star State is still basking in sunshine, those of you who are under grey clouds might want to take a look at my friend Kristi’s blog post about her research on Vitamin D deficiency. She’s a chemist by education, does her homework, and has awesomely credible sources, and this post is fascinating. This week, I was diagnosed with Vitamin D deficiency, and I will post more about all of that soon, but for now, check out her research and talk to your doctor about it! Get tested, and get your kids tested. My librarian friend Brigid sent this to me today – Pizza Hut has created a Book It! Alumni Program! You can sign up here, put your name and occupation on the alumni map, and — best of all — earn a free personal pan pizza! The program, which encourages children to read by rewarding them with pizza, turns 30 this year. Did you participate in Book It as a kid? Tonight we will participate with our Little Flowers group in the Worldwide Children’s Eucharistic Holy Hour. For 12 years this event, sponsored by the World Apostolate of Fatima, has been held on the first Friday of October. Children around the world come together today to pray for world peace, as Our Lady asked the children at Fatima. EWTN will be broadcasting live beginning at 10am EST. If your parish does not have an organized observance of this event, why not grab a few friends and head to your nearest Tabernacle? Specific prayers for the Holy Hour can be found here. I picked up this interesting looking dirt at a local farm a few weekends ago, and having been eyeing it suspiciously ever since. No really, it’s been sitting on my windowsill, unopened, until Wednesday when I finally faced my fears and tried it. It’s an herbal toothpaste made from clay, baking soda, a mineral, and some herbs. Also, it has myrrh. I was a little skeptical at first, knowing I was leaving the sweet familiarity of Colgate behind in favor of, well…dirt and myrrh. But ever since the FDA finally woke up to the dangers of triclosan, I’ve been searching for a reasonably priced, simple, safe, and effective alternative to my beloved red-and-white tube. And well, I think I’ve found it. A little of this stuff goes a long, long way. It’s very finely ground, and this made the texture a little easier for me to deal with. The taste isn’t terrible (but it ain’t no minty fresh, either!) For me, it is a more pleasurable experience than brushing with say, baking soda alone. THe payoff for me was how very clean my teeth felt after brushing. There was no phlegmy substance in my mouth after brushing, and my teeth feel so gosh-darn smooth! Love this stuff. This week at work, I was working on a project that took me to one of our office buildings that I don’t often visit. I was in a conference room in the center of the building all week, with no cell service unless I went out into the lobby or outside. Can I just say that no service = bliss? I knew this already, but was reminded of just how awesome it truly is. While this (re)realization is still fresh in my mind, maybe I should get around to finally reading Strange Gods by Elizabeth Scalia. Maybe. To round out our 7QT this week, I leave you with a praying parrot. Pretty appropriate for the Month of the Holy Rosary, don’t you think? 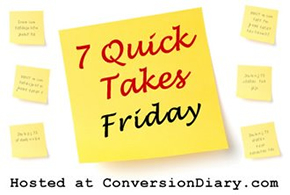 For more Quick Takes, visit Jen over at Conversion Diary! How exciting about the book it program.